We’d love your help. Let us know what’s wrong with this preview of Bolo! by David Weber. To ask other readers questions about Bolo!, please sign up. Be the first to ask a question about Bolo! So, for those that have read the Bolo-verse, this will probably seem pretty irreverent and ill-informed. I was only passingly familiar with this series before I read this book. To say 'incredible' in every sense of the word is my response. I think the only comparison I can draw is a passing familiarity with hard sci-fi in general or the sort of unimaginable scope in stories such as the fiction of Warhammer 40,000. To those who don't know, the Bolo is some kind of super main battle tank developed So, for those that have read the Bolo-verse, this will probably seem pretty irreverent and ill-informed. I was only passingly familiar with this series before I read this book. To say 'incredible' in every sense of the word is my response. I think the only comparison I can draw is a passing familiarity with hard sci-fi in general or the sort of unimaginable scope in stories such as the fiction of Warhammer 40,000. To those who don't know, the Bolo is some kind of super main battle tank developed and sent into the warzones of an alternate year 2000 (as the original stories were written in the seventies). From the technical specifications (helpfully provided in the back of the book, fully thirty four pages) these tanks seemed to start at 'mobile fortress' and end somewhere around 'Battleship sized army annihilating demigods,' sometimes in roughly that description. And they are, annihilating armies, with impressive detail of just how the various weapons systems and technologies are being used. This is strange, because as much as the book is about war machines, much of their stories are about how... Uh... Well... Tanks learn to love. Don't get me wrong, that's extremely amusing, it's just a little confusing to me. I've heard from friends all the standard stuff about this series, so I was ready for detailed descriptions of engagements and tanks with more weapons than most modern countries, but seeing how oddly human the tanks could be portrayed was certainly unexpected. Their AIs seemed painfully aware of their design and function as a weapon of war, but they found very conflicting emotions shoved into that AI: maintaining professionalism when dealing with a superior officer one happens to have fallen for, being forced to hunt down a comrade who's seemingly gone crazy. Their human 'commanders' take such lessons with them as well. Launching a nuclear strike? Easy for a Bolo, but how does the Bolo handle emotional trauma, an 'enemy' not so easily dispatched? Do I find it a little silly? Certainly. I honestly went into the book expecting purely ironic enjoyment. The introduction of hyper intelligent AI, however, did seem to introduce something new to me, that being an AI that doesn't 'go rogue' as it were. So many stories about intelligences superior to humanity seem to focus on the idea that humanity will quickly be subjugated by them, this book seems to posit that not only will they not, but in fact they'll become devoted to us. Does that twist into obsession? Does the influence of it's creators shape the machine or is it the other way around? Is it better or worse for that? Is it possible to consider something a someone, even to the point of attraction or even full blown romantic affection or real, genuine love? Perhaps difficult to consider in context, but having read and been influenced by it, could the answers to those questions change how a reader sees the things that surround them? While I must admit, I don't make a habit of reading hard sci-fi stories, often for reasons that make a presence in this book. I don't think focusing on a precise technical readout is terribly interesting, and as much as warfare isn't always the focus of a hard sci fi story, to me much of it seems to devolve into so many laser blasts and fancy weapon names. That said, I think I enjoy the human element of these stories enough that the sharp contrast of the combat scenes don't curb my interest. I do feel a little lost in the narrative at times, vast jumps in time only described seemingly after important details have been established. That said, I guess those complaints are fairly minor compared to what I see as the stories' point. I've only ever been lightly into the Bolo-verse -- I read some of Laumer's original stories waaaaay back when, but knew little else. This volume (which, arguably, wraps up the entire Bolo saga through a progressive series of short stories) was a great read, dealing with the issues of machine intelligence vs human instinct, and where emotion and soul start to play a role in both. The Bolos, as ultimate fighting machines in an ever-escalating set of wars fought by Humanity against alien adversarie I've only ever been lightly into the Bolo-verse -- I read some of Laumer's original stories waaaaay back when, but knew little else. This volume (which, arguably, wraps up the entire Bolo saga through a progressive series of short stories) was a great read, dealing with the issues of machine intelligence vs human instinct, and where emotion and soul start to play a role in both. The Bolos, as ultimate fighting machines in an ever-escalating set of wars fought by Humanity against alien adversaries, epitomize all that is right and wrong, noble and heinous, in their human creators -- and, in the end, serve to raise both themselves and Humanity to their next level, beyond the constant warfare for which they were designed. This was definitely a re-read, but I can't recall when I first read it. Wonderful stories! Weber does every bit as good a job as Laumer did, which is amazing. It's been years since I read Laumer's original Bolo stories, but I think you could read them back to back without a problem. The tone, points & style are all perfect. The theme of the horror of war blended with the courage & convictions of the warriors came off very well. The last story strikes it all home wonderfully. The idea that This was definitely a re-read, but I can't recall when I first read it. Wonderful stories! Weber does every bit as good a job as Laumer did, which is amazing. It's been years since I read Laumer's original Bolo stories, but I think you could read them back to back without a problem. Ever since watching Star Wars at the drive-in theater outside Wolf Point, Montana at the tender age of five, I have been a avid fan of technology (toys). BOLO is a big toy. Ok a big monster of a machine that is just awesome. I haven't read all of the BOLO books. This one is a bunch of short stories set in the BOLO universe. Even though they are short stories, they seemed to be linked as they progress. Very cool read and enjoyed it. A series of short stories. Some good; some not. If you've read one Bolo book you've pretty much read them all. "Bolo!" Another David Weber novel. I've been ill so I'm submerging myself in fun reading. Weber is best known for his military science fiction. While the characters in this book are not his own, he picks up the idea of the Bolo (a self-aware super-tank) to write a number of stories of the future great great great grandchild of the Abrams Tank. The Bolo tank is massive and with so much computer power it has become sentient. It's alive, in a sense. It feels pain. It has emotions and it has honor. "Bolo!" Another David Weber novel. I've been ill so I'm submerging myself in fun reading. Weber is best known for his military science fiction. While the characters in this book are not his own, he picks up the idea of the Bolo (a self-aware super-tank) to write a number of stories of the future great great great grandchild of the Abrams Tank. The Bolo tank is massive and with so much computer power it has become sentient. It's alive, in a sense. It feels pain. It has emotions and it has honor. Battle Fleet loses track of the paperwork of a Bolo Mark 23 (experimental) and lets her commander die of old age on the planet of Santa Cruz. The Bolo remains on stand-by for decades until awakened by a new commander who discovers that this Bolo named Nike has a personality and abilities well beyond what is allowed under strict regulations. She will need every bit of it to defend Santa Cruz. In the next story a Mark 25 Bolo is suffering from severe battle damage to it's personality center but it has a single purpose in what is left of it's mind. It must get to the green hills before the Enemy catches up. It must make it or die in the attempt. In the third story, Lt. Maneka Trevor has graduated from the Academy and is surprised and frightened to learn she has been given command of her own Bolo. It will be up to this ancient and decorated Mark 28, some of those decorations earned before she was born. She knows they will never be called to frontline duty... that is until the front moves and she and her fellows must defend a world of billions of people from extermination using outmoded, out-classed and out-numbered machines. The centuries of the war pass beyond memory for all but the Bolos. In the Final battle a Mark 33 Bolo is destroyed and fades to blackness and peace, at last, but he wakes up later, much of his hardware repaired by his autonomous nanotech. Nothing is left of the human race except for a few farmers who are nursing the corroding technology. It is up to the Mark 33 Bolo to protect the colony with what is left of his armor and weapons and to teach compassion to those young men who were born having never known war. The writing was pretty good but with simple goals. Weber is trying to pull at the heartstrings and he does a fair job of it but in the format of short stories and novelettes on a theme... not an entire integrated book-sized story. I liked it nevertheless and will probably read it again some time. I've begun the second book "Old Soldiers" which is composed (apparently) of additional stories that were hinted at in "Bolo!" but not fleshed out. It starts out with Lt. Maneka Trevor once more, defending colonists trying to flee the extermination of the human race. Apparently she was able to regenerate that arm she lost in the last book but psychologically she is still hurting. Bolo! isn’t necessarily a bad book. It’s just that it’s not that great either, at least not by David Weber’s standards. Apparently, one Keith Laumer created the Bolo decades ago. It’s an uber-tank, one with so many uber-weapons on it, everyone in the universe knows of it and is terrified of it. Just one alone can defend an entire planet. One can level an entire city while shooting down warships attacking the planet. It’s farfetched, but intriguing as a premise. And apparently, many authors have Bolo! isn’t necessarily a bad book. It’s just that it’s not that great either, at least not by David Weber’s standards. Apparently, one Keith Laumer created the Bolo decades ago. It’s an uber-tank, one with so many uber-weapons on it, everyone in the universe knows of it and is terrified of it. Just one alone can defend an entire planet. One can level an entire city while shooting down warships attacking the planet. It’s farfetched, but intriguing as a premise. And apparently, many authors have written stories and books with Bolos as their theme. This Weber book is a compilation of some short stories he wrote, mostly during the 1990s, collected here in one volume. It could be decent, but it’s not exactly what I expect from Weber, so I didn’t finish it. I must say I have read only "Miles to Go" out of this book and the entire Bolo universe. But I don't have enough stars in the bar to rate it. The story is so great in both the descriptions of the future tech and the characters, their minds and emotions, so gripping and touching. I've reread it several times and always head something like tears at my eyes at the end. Four stories in one book, all of which are superb! 4/5 of this compilation of Bolo stories by David Weber were previously published in Book #3 & #4. I'm reading out of order in this series, so it was all new stuff for me. The 1st story, 'Miles To Go' is about a Bolo named Nike who was forgotten, along with her commander, on a backwater world. She's not just any Bolo though, she's a one of a kind prototype and her commander made many unofficial upgrades to her for personality matrix...80 year Four stories in one book, all of which are superb! 4/5 of this compilation of Bolo stories by David Weber were previously published in Book #3 & #4. I'm reading out of order in this series, so it was all new stuff for me. The 1st story, 'Miles To Go' is about a Bolo named Nike who was forgotten, along with her commander, on a backwater world. She's not just any Bolo though, she's a one of a kind prototype and her commander made many unofficial upgrades to her for personality matrix...80 years ago! Now someone finally remembers where she's parked, and a new commander arrives just in time to head off some trouble for the planet of Santa Cruz! Oh yeah, and they fall in love, sorta. The 2nd story, 'Traitor' is short and creates yet another example of how there's never really such a thing as a Rouge Bolo. I won't say more because that would be spoiling. Story #3, 'With Your Shield', introduces us to Benjy and his very green young commander who becomes a close friend to her aging Bolo, but is forced to defend a neighboring world with little preparation while also being vastly outnumbered by the enemy. But Bolos never quit! Finally, story #4, 'A Time to Kill', gives us the history of the Final War between Humanity & the Malconian 'Dog Boys'. It is very well written and give a perspective I have not seen often. That being the necessity of having to do something horrible because you have no other choice... kill or be killed, but on a genocidal level. And, lastly, you can read about the 'Technical History of the Bolo' which takes you through the full history of the development of the Bolo, it's subsequent upgrades, and the politics of the Concordiant that created it. 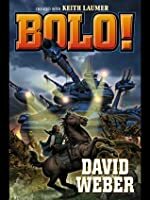 "a consistent producer of highly entertaining and intelligent action tales" Booklist "Great stuff compelling combat combined with engaging characters for a great space opera adventure" Locus"
This is David Weber's addition to the pile of "Bolo" stories that many other SF authors have written. A Bolo, for those who don't know, is essentially a sentient tank, a self-award and able-to-think weapon of war in some far flung future where such things make sense. 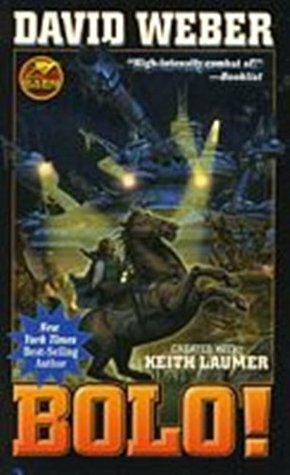 Bolos were first conceived of by Keith Laumer, way back when, and I was never really impressed with the Laumer stories I read talking about them. David Weber does a better job, I think. This book is a set of a number of short stories This is David Weber's addition to the pile of "Bolo" stories that many other SF authors have written. A Bolo, for those who don't know, is essentially a sentient tank, a self-award and able-to-think weapon of war in some far flung future where such things make sense. This book is a set of a number of short stories and novellas set across the Bolo history, so it's interesting to see how the different technological levels of them are addressed. Weber has always written excellent military fiction, and these stories fit in very well with his skill set. The Bolo stories are interesting as well because they allow for much more complex thinking (both ethically and strategically) by the weapons themselves, and I really liked Weber's approach. At any rate, I liked it enough to give Weber's sequel a shot. I got this one as a gift for a birthday... and tore through it, cover to cover in two days flat... I am not entirely positive, but I think it was '08... might have been '07 though. I don't want to put any spoilers out there for those that haven't picked this book up yet, but I think there is enough in the description to be safe saying that this is a character driven Sci-Fi of epic scale. I had, at the point of reading this never seen a computer portrayed as such a caring, emotional and tangible c I got this one as a gift for a birthday... and tore through it, cover to cover in two days flat... I am not entirely positive, but I think it was '08... might have been '07 though. I don't want to put any spoilers out there for those that haven't picked this book up yet, but I think there is enough in the description to be safe saying that this is a character driven Sci-Fi of epic scale. I had, at the point of reading this never seen a computer portrayed as such a caring, emotional and tangible character in a novel. Since then I have found only one other author that comes close to this kind of skill in showing a machine to be as human as the rest of us. And thank you for letting us read your work. What a great storm day book. I just finished "Miles to Go". What happens when a researcher is forgotten with her Bolo, a new prototype, on Santa Cruz, a planet at the edge of civilization? She creates Nike, a Bolo who has learned old world poetry, and can make her own decisions. Then a war happens and all records of the Bolo in Santa Cruz are lost. Enter Lorenco Esteban, sent by the Navy to check out a forgotten Bolo installation. When a Bolo runs from a final stand, another is sent to chase it What a great storm day book. I just finished "Miles to Go". What happens when a researcher is forgotten with her Bolo, a new prototype, on Santa Cruz, a planet at the edge of civilization? She creates Nike, a Bolo who has learned old world poetry, and can make her own decisions. Then a war happens and all records of the Bolo in Santa Cruz are lost. Enter Lorenco Esteban, sent by the Navy to check out a forgotten Bolo installation. When a Bolo runs from a final stand, another is sent to chase it down in "The Traitor". I do not want to give this one away so I will just say that is is a great plot with good pacing. I think I have already spoiled a few things, but wow I could not put Weber's stories down. While Weber's quirk of describing the duel between missiles and point defense in detail is well in evidence, these are some of the best bolo stories ever written, mostly focusing on the relationship between the humans and their magical ponies...I mean cybernetic killing machines. In Miles to Go we see the consequence of giving a Bolo a really human-like artificial intelligence. In The Traitor we see another self-aware Bolo hunt another Bolo who did the unthinkable and ran away from the fight. Wit While Weber's quirk of describing the duel between missiles and point defense in detail is well in evidence, these are some of the best bolo stories ever written, mostly focusing on the relationship between the humans and their magical ponies...I mean cybernetic killing machines. In The Traitor we see another self-aware Bolo hunt another Bolo who did the unthinkable and ran away from the fight. With Your Shield is another story about a self-aware Bolo and the human who loves it. Finally, A Time To Kill is a story about just how far war can go to extremes. Weber does a good job with the Bolo stories. In fact I can only think of a few things from Weber I disliked. That being said, Laumer does a better job at telling Bolo stories. The stories are good and the characters realistic. What I liked the most was the way he shows how the Bolos think and the technical data at the end. A good book but it does not hold a candle to the Starfire series. All in all it is a good book to pass the time with at the dr's office but not something to rush out and buy. Recommends it for: Science fiction fans, especially those of the military genre. Bolo! is, of course, a great book for anyone into the "Bolo" series, but if you're thinking of buying it be aware that 3 of the 4 short stories in this book are also in the numbered books; specifically "Miles to Go" from book 3 "The Triumphant", as well as "The Traitor" and "A Time to Kill" from book 4 "Last Stand". The fourth story "With Your Shield" is a great story as well as the setup for the book "Old Soldiers". You know what they say, the first taste is free. Weber did a class act in following up on the Bolo tradition. These stories do Laumer proud and I thought they were excellent tales. If you're a fan of the Dinochrome Brigade I think you'll love these. Writing about honor in war can be surprisingly touching, and reading these stories over the Memorial Day weekend in the United States was my tribute to the sacrifice of those who give their all in the defense of others. Combat sci-fi with a twist of humanity inside a machine. Four stories tied together by the futuristic tank that is central to them all. Bolo is a fun read, and exactly what I would turn to when looking for an action filled story that is also thought provoking. Giant, self-aware tanks. Excuse me, there is an entire collection of novels I need to start reading. The last two stories, about mankind's mutually genocidal war against the Melconians, were especially riveting. Bolo: A giant, cybernetic tank. Heavily armed, nearly indestructible, and programmed for battle. Much better written than the Bolo stories by Kieth Laumer (who invented the Bolo). There wasn't really any chance that I wouldn't enjoy this - four loosely linked novella's about fully self-aware AI giant tanks, written by a favourite author. Awesome. Opowiadania o czołgach obdarzonych sztuczną inteligencją. David Weber w pełnej krasie. Stupid book. Every time I read it I get something in my eyes at the end if the stories. 'Miles to Go' is the worst one. Great stories all. Love the Bolos. Easily my second favorite Bolo book, with Old Soliders being the favorite. One of his most popular and enduring characters is Honor Harrington whose alliterated name David Mark Weber is an American science fiction and fantasy author. He was born in Cleveland, Ohio in 1952. One of his most popular and enduring characters is Honor Harrington whose alliterated name is an homage to C.S. Forester's character Horatio Hornblower and her last name from a fleet doctor in Patrick O'Brian's Master and Commander . Her story, together with the "Honorverse" she inhabits, has been developed through 16 novels and six shared-universe anthologies, as of spring 2013 (other works are in production). In 2008, he donated his archive to the department of Rare Books and Special Collections at Northern Illinois University.